What are the parts that make up a hotend, and what do they do? My first and only 3D printer is a Printrbot Simple Metal, which has a hotend that doesn't expose any of its internal parts. Easy for beginners, I suppose: "The hotend is that tube that heats up the plastic and deposits it on the print bed." But I've been trying to learn more, and many hotends out there don't look quite as simple. My Printrbot hotend probably isn't as simple as it looks, either. This varies by hotend design. 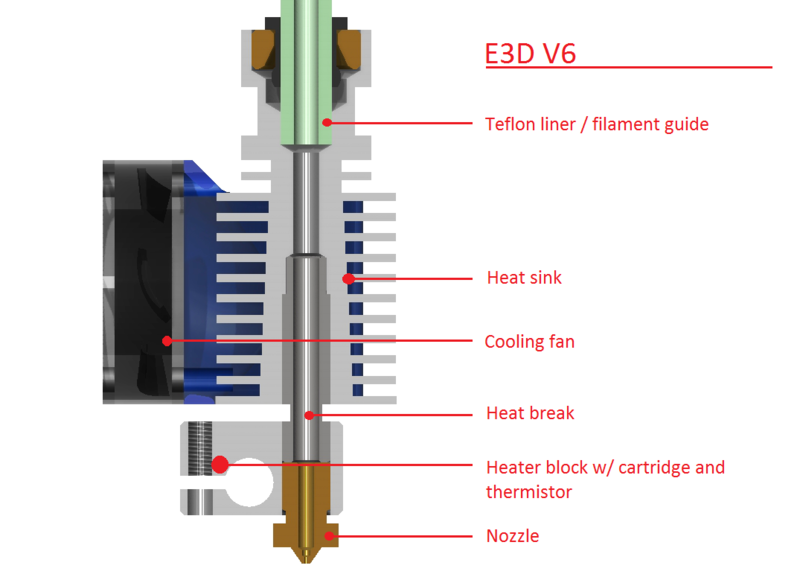 The following is a list of components which you might find in a typical hotend, but note that different designs may integrate these components to some extent. For instance, on the J-head the heat block, nozzle and heatbreak are all one and the same component whereas on the E3D hotends these are all separate parts. Nozzle: This is the part where the filament comes out. It takes in the molten filament (typically as a bead of 1.75mm/3mm) and tapers down to the nozzle size (typically around 0.4mm). These are typically made of brass for its good heat conductivity, but brass is not suitable for printing abrasive materials (such as glow in the dark and metal-filled filaments) so sometimes (hardened) stainless steel is used. Heater Block: Usually made from aluminium, the heater block joins the nozzle to the heat break and holds the heater cartridge and thermistor. Heater Cartridge: most hotends use a ceramic heater cartridge, though some older designs use power resistors or nichrome wire. This component is, as the name suggests, responsible for heating up the hotend. The heat block usually clamps around the heater cartridge to provide good contact. Thermistor: This part senses the temperature of the heat block. It is usually a small glass bead with two wires attached (which are typically insulated with glass fiber or teflon). For high-temperature printing, a thermocouple may be used in stead. Heat Break: this is the part where hot meets cold. It usually takes the form of a thin tube and is made of stainless steel for its low thermal conductivity. The goal is generally to have the transition be as short as possible so as little of the filament is in a molten state as possible. It connects the heat block to the heat sink. Heat Sink: the purpose of the heat sink is to cool down the cold side of the heat break. It is typically cooled with a fan. Most heat sinks also have a standard groove-mount for mounting to your printer. The heat sink usually has grooves to increase its surface area and cooling capability. Teflon Liner: some hotends have a PTFE liner that guides the filament through the heat break into the nozzle. This makes it easier to print PLA, but compared to an all-metal hotend, limits the temperatures at which you can print (making it difficult to print PETG and impossible to print polycarbonate). The ubis hotend you mentioned is a bit simpler than this, and simply uses a big chunk of PEEK in place of the heat break/sink. PEEK has very low thermal conductivity and thus passive cooling is sufficient. However, PEEK limits the temperatures at which you can print. Note that in this image the Teflon liner only goes into the heat sink, and not into the heat break or block. This means the maximum temperature is not limited by the Teflon, but if it did go all the way in (as is the case with, for instance, the Lite6) then it would be. This hotend is made out of PEEK plastics (beige). It can work in temperature upto 250C. As it is also good heat insulator then it doesn't need to have cooling fan. Red part on this picture is just a cover (insulator) of the heater which heatup nozzle (gold). Black are just wires and connectors. This hotend is metal so it needs two things - cooling fan and heat barrier. Beginning fron the left - red wires are connected to (silver) block which is heater itself. Between the block and this round silver part (which is a heatsink) there is heat barrier (thin pipe which is poor heat conductor). Heatsink has plastic funnel (blue) which directs an airflow from fan (black) through heatsink. Not the answer you're looking for? 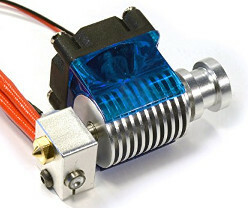 Browse other questions tagged hotend or ask your own question. What are the advantages and disadvantages of an all-metal hot end compared to one with a PTFE heat break? What is the power consumption of the heatbed and hotend?